A theory proposed by S.R. Ranganathan before the advent of the digital age detailed the five principles of operating a library system. Since its publication in 1931, a number of variants have been suggested—but rather than rewriting the principles, let’s examine how “The Original 5” still apply today. Libraries were the original repositories of knowledge. The challenge libraries face today is that they are no longer simply destinations which house a physical collection—knowledge is now everywhere. 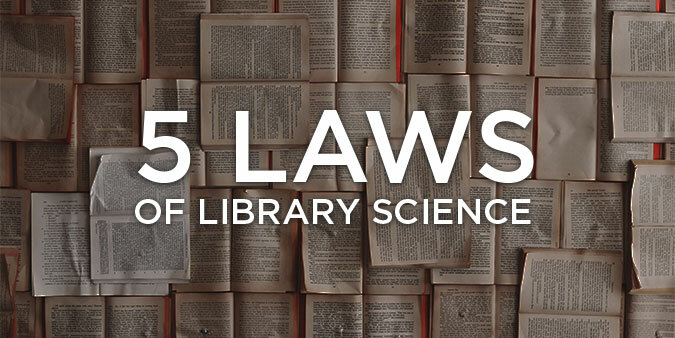 Ranganathan’s first law posited that "books are for use," meaning that books in libraries should not be shut away from users… and this concept pertains to all forms of knowledge, within and outside the physical library. The need for libraries to serve humanity—i.e. collect, curate and catalog knowledge to ensure its accessibility—is as relevant and important as ever. The image we share of libraries is that of a building (or room) full of books. Other than the spoken word, books and scrolls recorded and stored knowledge so that it could be communicated. After several thousand years of following this practice, libraries started building collections of different knowledge storage media, such as photographs, vinyl records, and tape recordings. The second law of library science, "every reader his/her book" means that librarians serve many different groups, build content to accommodate many needs, and do not sit in judgement of readers’ choices. The possible absence of a physical knowledge storage object doesn’t dilute the power of Ranganathan’s second principle; it is certainly relevant to media in all forms. And per the first law, the information explosion facilitated by the internet (another form by which knowledge is communicated) only expands and reinforces the need for librarians to do what they always have. Dr. Ranganathan believed that a library system must devise and offer many methods to “ensure that each item finds its appropriate reader”. The third law, “every book his/her reader,” can be interpreted to mean that every knowledge resource is useful to an individual or individuals, no matter how specialized and no matter how small the audience may be. Library science was, and arguably still is, at the forefront of using computers to make information accessible. The concepts embodied in this third law still apply. However, they apply to all information, not just physical objects. State of the art library systems can now manage extraordinarily complex collections that encompass a broad range of physical and digital resources. It should be noted that cost is no longer a barrier to building a great collection—the fee per seat of this technology is now equivalent to ~1% of a qualified librarian’s salary. Digitization has democratized access to knowledge. Great works of knowledge are now easily shared. The challenge, as the universe of digital knowledge expands, is to chart all areas of this universe so that free access doesn’t mean “impossible to find.” The fourth law of library science, "save the time of the reader," dictates that all patrons should be able to locate the material they desire easily, quickly and efficiently. Massive search engines and artificial intelligence as embodied by IBM’s Watson may win at Jeopardy—but even the information Watson required to “train” for competition was categorized! Libraries have always held the past in high regard, and of course that remains important. However, Ranganathan’s fifth law of library science, "the library is a growing organism," requires that a library must continually change, and must update its collection, its methods for ensuring access, and now, its virtual presence… over time.